Hvernig mynduð þið verðleggja svona vél? Lestu undir hana, efst. Ættir að sjá "model no. A1466" eða svipað orð fyrir miðju í fyrstu línunni. Asistoed skrifaði: stendur bara "mynd"
myndin per se virkar, browserinn er bara að blokka þetta því mynda.vaktin.is er með útrunnið ssl skilríki, sem geriri hana "unsafe". 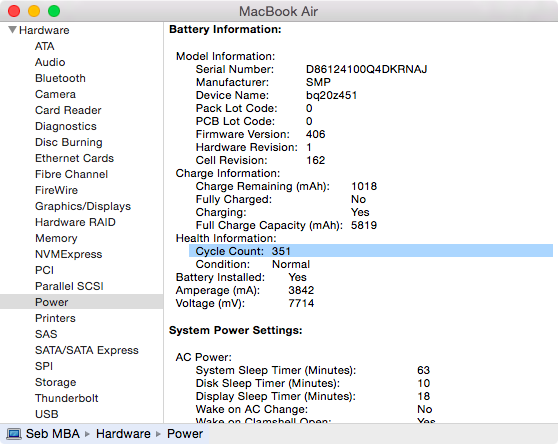 To find out what your MacBook’s battery cycle is, go to  > About This Mac > System Report, and select the Power tab, under Hardware. In the right panel, you will find the Cycle Count, as showed below.